The Bank of America Digital Mortgage Experience™ puts you in control. Prequalify to estimate how much you can borrow, or apply for a new mortgage online. You can also refinance your existing mortgage. Thinking about buying a home? Prequalify now to estimate what you can borrow. Visit our Real Estate Center to find your next home and search for home values. Apply for financing and get the mortgage that meets your needs. 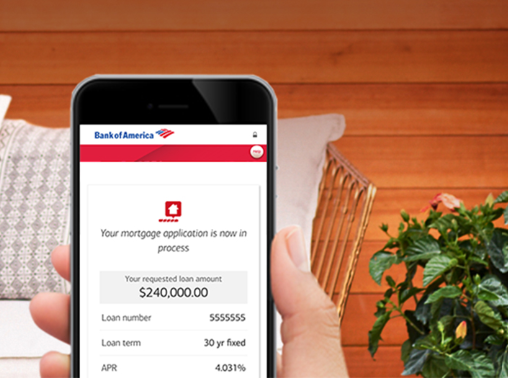 The Bank of America Digital Mortgage Experience™ puts you in control. Prequalify to estimate how much you can borrow, apply for a new mortgage, or refinance your current home. All with customized terms that meet your needs. Hey honey. Want that house we better get moving. Okay Dad, I’m already on it. of stuff to print out. closing costs to lower monthly payments. I can’t find my car keys. Have you seen them? At any point, you can save your application for later. No need to Dad, we’re good. lock it in if we can. or leave it open and lock later. Alright but what if you have questions? I can talk to a lending specialist if I want. You’re in control every step of the way. Wow, your first house. That really is something. I couldn’t have done it without you Dad. keep it simple. Apply for your Mortgage online today. Father: Hey honey. Want that house we better get movin. Daughter: Okay Dad…I’m already on it. Narrator: Bank of America’s Digital Mortgage makes it simple and easy to apply for your mortgage online and on your time. Father: You’re gonna need these. We have a lot of stuff to print out. Narrator: Reduce paperwork and save time every step of the way. Narrator: You can review loan options and select features that matter to you…ranging from lower closing costs to lower monthly payments. Father: I can’t find my car keys. Have you seen them? Daughter: I’ll be right there. Narrator: At any point, you can save your application for later. Father: Oh great. Let me grab my coat, we’ll run to the bank and see what they have to offer. Daughter: No need to Dad, we’re good. Father: Honey the rates are low right now we should try to lock it in if we can. Daughter: We can do it right now. Narrator: Pick up where you left off even on a different device and lock your rate to avoid the risk of rising rates, or leave it open and lock later. Dad: Alright but what if you have questions? Daughter: I can talk to a lending specialist if I want. Narrator: You’re in control every step of the way. Dad: Wow, your first house. That really is something. Daughter: I couldn’t have done it without you Dad. Narrator: When life gets complicated, Bank of America helps keep it simple. Apply for your Mortgage online today. The prequalification process is a great way to see how much you can borrow. This can help you to narrow and simplify your home search. Use our Digital Mortgage Experience to get prequalified now.